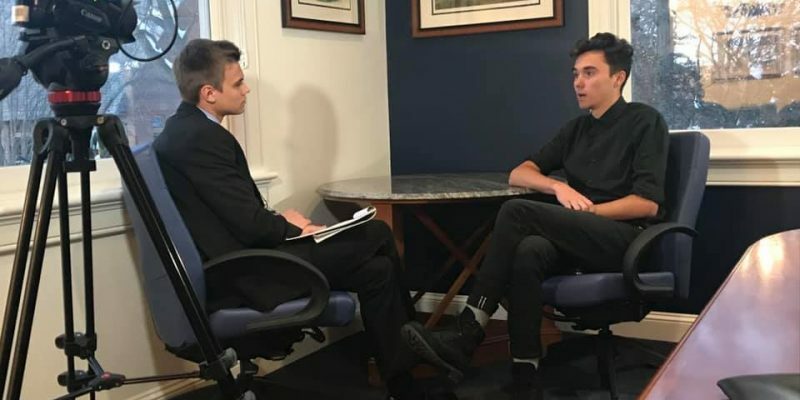 David Hogg, a survivor of the shooting at Marjory Stoneman Douglas High School in Parkland, Florida, is interviewed by UConn Journalism student Luke Hajdasz before a March 2019 event in Storrs. 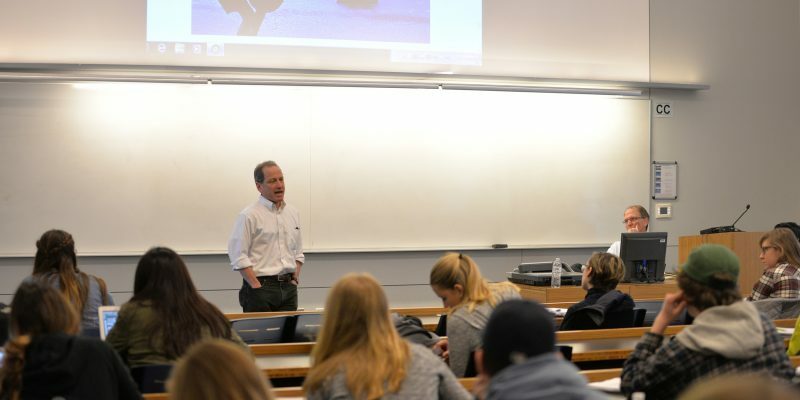 UConn Journalism's Scott Wallace, right, provided a fascinating look into what it was like to cover wars in Central America in the early '80s at an March 2019 event. Photojournalist Robert Nickelsberg, at left, said the reporters and photographers in El Salvador easily moved between both sides of the conflict. 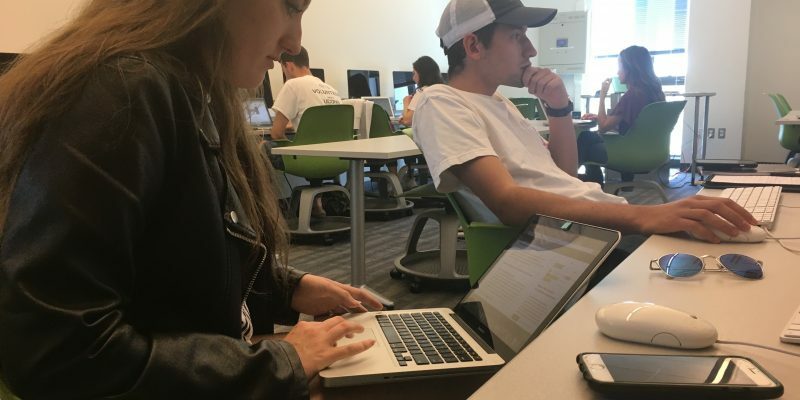 UConn journalism seniors Caitlin Culligan and Caio Goncalves work on #TheRoundupCT weekly newsletter in Fall 2017. 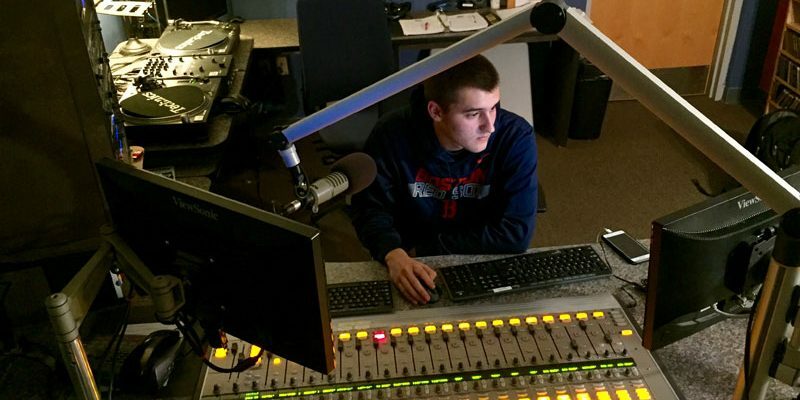 Journalism major Joe Stickles works the board at UConn's community radio station, WHUS-FM. 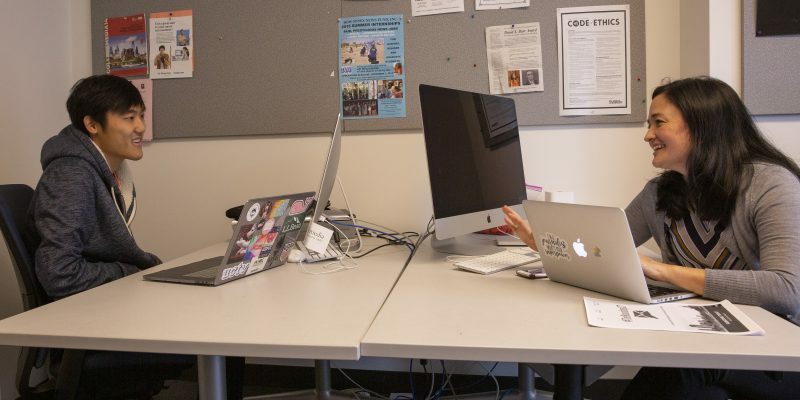 Faculty in UConn's journalism department possess skill sets in all mediums of news delivery. They bring decades of experience in print, visual, broadcast and digital journalism to their lectures and assignments. 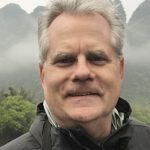 Associate Professor Scott Wallace (pictured), a frequent contributor to National Geographic magazine, joined the faculty in 2017. He is the author of "The Unconquered: In Search of the Amazon's Last Uncontacted Tribes." 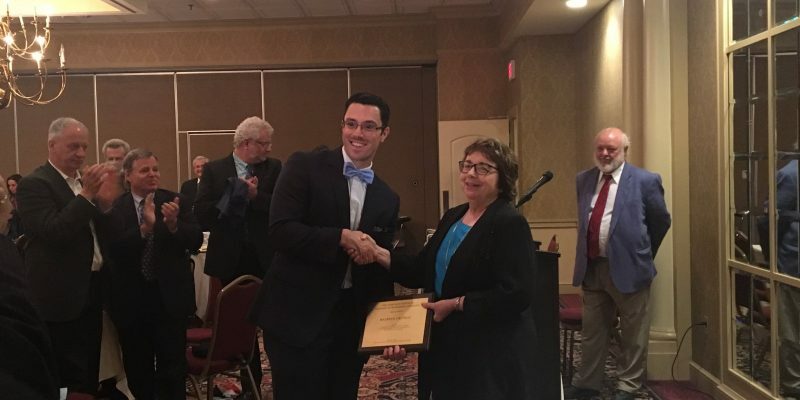 In 2018, Amanda J. Crawford was added to the faculty as an assistant professor. She is a veteran political reporter and essayist who previously worked for Bloomberg News, The Arizona Republic, Baltimore Sun and People. To be included in our Alumni Directory, please fill out our Alumni Info Form. Many of our alumni are featured in this video commemorating the UConn Journalism Department's 50th anniversary. Internships are the best way for students build professional experience before graduation. 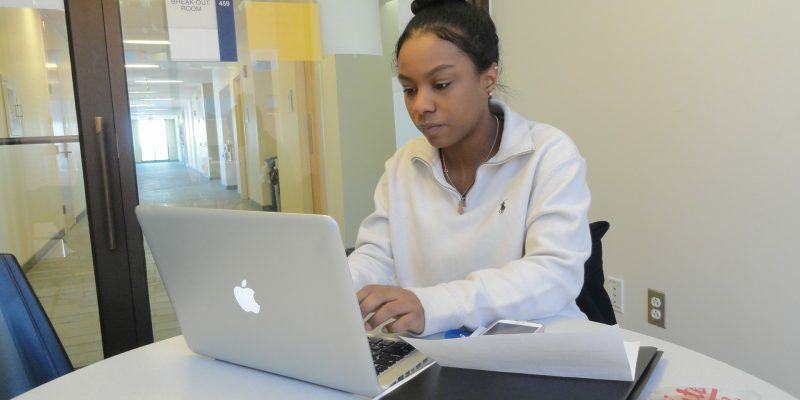 After gaining skills in courses and at UConn's student newspaper, TV or radio stations, seeking paid and for-credit internships are an integral next step. For example, UConn Journalism senior Gabrielle Levesque '14 was one of 16 interns for NBC's Today Show during the 2014 Winter Olympic Games in Sochi, Russia. Special events are planned and hosted by UConn Journalism department faculty to expose students to professional journalists from all corners of the news industry. 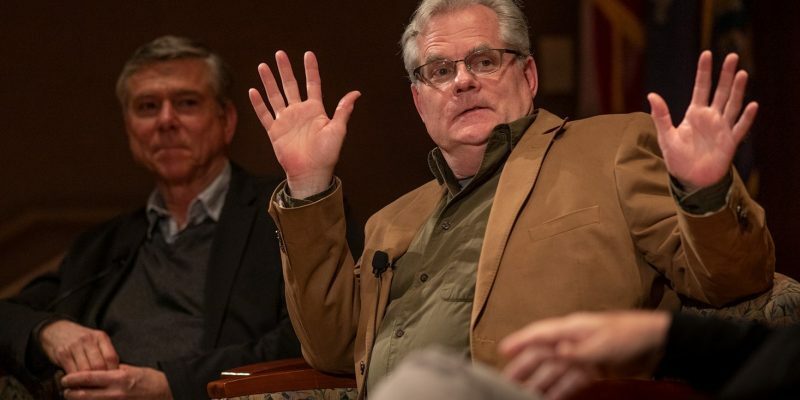 In March 2019, Associate Prof. Scott Wallace hosted an exhibition, “In The Crosshairs: Dispatches From Central America, 1983-1990,” accompanied by a panel discussion on the eruption of civil wars across Central America with a TIME photographer and journalist from The New Yorker. In February 2018, Associate Prof. Marie K. Shanahan hosted a timely panel discussion about "Confronting Racism as Journalists" with columnists from The Washington Post, Philadelphia Daily News and NBC Asian America. The department also supports the student-run UConn Journalism Society. Pre-journalism majors can participate in our First Year Experience program. 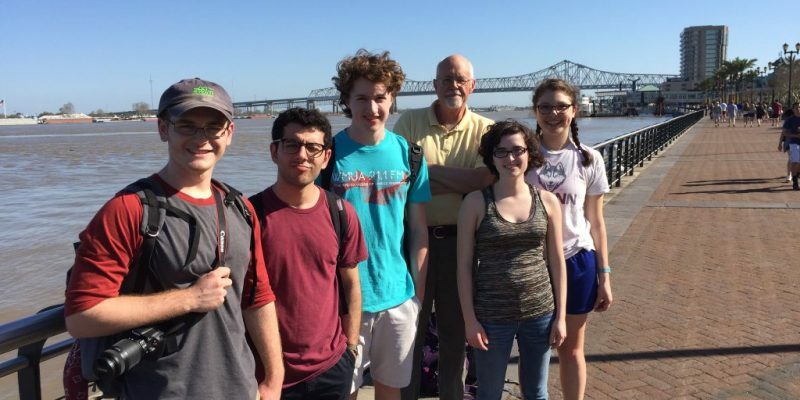 Louisiana Underwater, Food for Hartford, and West Stockbridge Stories. 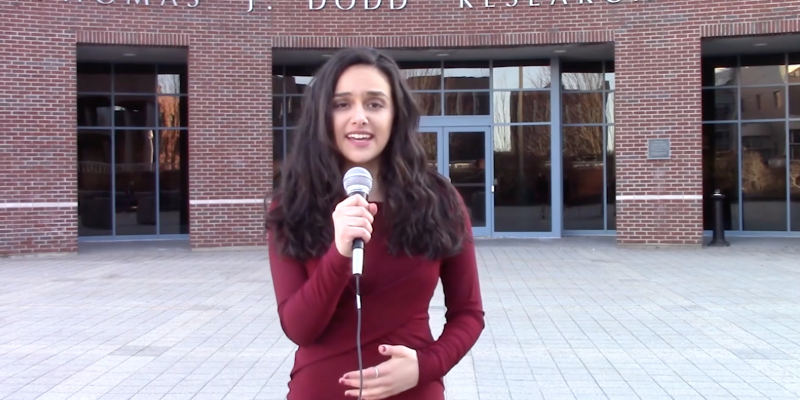 See more student work on our UConn Digital Journalism site. Many of our UConn Journalism majors contribute to The Daily Campus, WHUS Radio and at UConn's student run television station, UCTV.